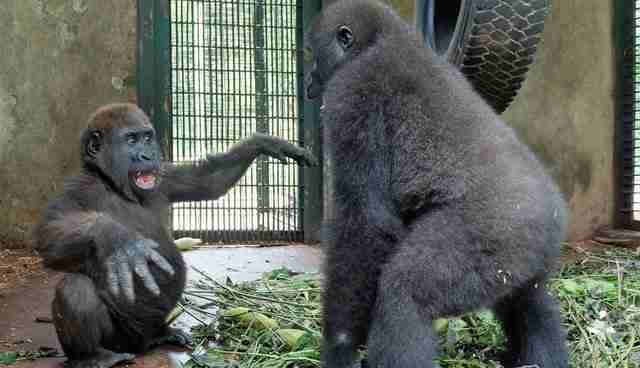 When a little gorilla named Parry first came to live at a sanctuary, he'd already been through quite a lot. At just 5 years old, Parry had already been kidnapped from the wild when he was just a baby and kept as a pet. But when he grew to be too large to handle, his owners just abandoned him back in the forest. Having learned no survival instincts (which he would have normally learned from his mom), Parry was found ravenous and clinging to a tree where he'd found some mangoes to eat. Luckily, authorities knew the exact right place for this little displaced gorilla. 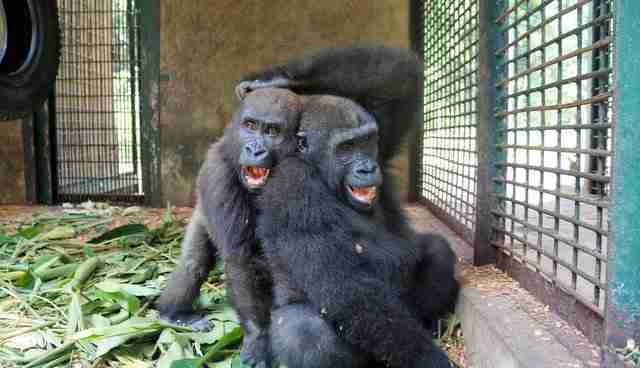 In 2016, Parry arrived at Ape Action Africa's Mefou Primate Sanctuary in Cameroon. And that's when he met perhaps the most important individual in his life: Chris. Chris had arrived at the sanctuary three years before, when he was just a 4-month-old infant gorilla. Chris had needed a family just as much as Parry did. 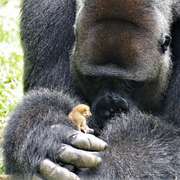 He had been given to a couple as a gift, and when the couple realized that there was no way they could raise a gorilla, they brought him to the sanctuary. "Until [Chris] was 2 he was cared for by a team of caregivers and, because there were no other very young gorillas at the sanctuary at that time, he lived first with Cazza, and later with Daphne, both young orphaned chimpanzees," a spokesperson for the sanctuary told The Dodo. So when Chris and Parry met each other, they both seemed to become a little bit more complete. They immediately started playing and wrestling with each other until they both collapsed with exhaustion. And since then their games have only gotten funnier. Most recently, caregivers managed to film just some of their hijinks when the friends didn't even know they were being watched. Chris had decided that Parry, in addition to being a great friend, also made a handy stepladder, and so was balancing on his friend's back, while Parry tried to keep on walking. It appeared that Chris was perhaps trying to investigate something in a nearby tree — but promptly forgot it when he started to tumble down. 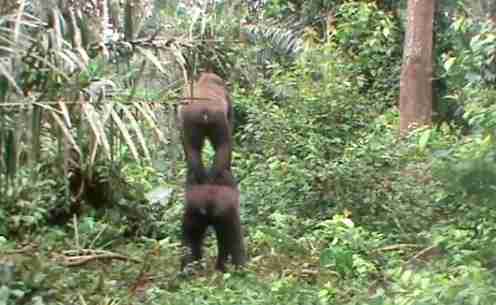 "We're not sure what young gorilla Chris was looking for in the forest," the sanctuary wrote, "but Parry was happy to give him a bit of a lift before they enjoyed an enthusiastic round of wrestling." For primates, horsing around is surprisingly serious business — playing actually helps young apes cement social bonds and develop problem-solving skills. That playing is also loads of fun is just a happy bonus. "We all need a friend like Parry who gives us support and also makes us laugh!" Ape Action Africa wrote. You can be a friend to Chris and Parry, as well as many other rescued apes, by making a donation to the sanctuary they call home.